Information assembled by Sue Bottom, symptom descriptions and prevention tips extracted from Orchid Species Culture by Margaret L. and Charles O. Baker, the Hark-Orchideen website and Harry C. Burnett's articles in the AOS Bulletin. Fungicides and Bactericides for Orchid Diseases (follow label instructions and wear protective equipment). Symptoms: Small water-soaked spots appear on the leaves and often are surrounded by yellow halos. If unchecked, the infection will rapidly rot the leaves and roots and spread more slowly into the rhizomes or pseudobulbs. This wet rot may have a foul odor and has a water soaked appearance. - Phalaenopsis. Disease spreads so rapidly that plants may be completely rotted in 2 to 3 days. The bacteria are opportunistic organisms that can enter through wounds. - Dendrobium. Leaves appear yellow and water-soaked and become black and sunken. - Vanda. Leaves develop translucent patches which become black and sunken. - Paphiopedilum. Leaves develop small, round spots often near the middle of the leaf. The spots are initially yellow and water-soaked but eventually become reddish brown and sunken. The spot enlarges in all directions and may reach the growing crown before the leaf tip is affected. If untreated, the disease quickly spreads throughout the plant, leaving it a dark, shriveled mass. - Grammatophyllum. Leaves have water-soaked, browning spots which become black and sunken. 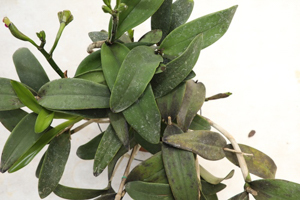 Treatment: Immediately remove infected tissue using a sterile instrument, spray bactericides containing quaternary ammonium products like Physan or copper compounds on infected and adjacent plants following label instructions (copper should not be used on dendrobiums or blooming plants), or apply the home remedy of hydrogen peroxide. Disinfect growing area with 10% bleach solution. Treat nearby plants as well as those that are diseased. Prevention: The disease is spread by splashing water so avoid overhead watering if the disease is present. The pathogen favors hot and moist conditions, so if infection occurs, keep leaves dry, increase air circulation and reduce temperature and humidity (if possible). Periodic preventive sprays with copper compounds help to prevent infection, particularly during hot and humid weather (do not apply copper to dendrobiums). Always follow label instructions. 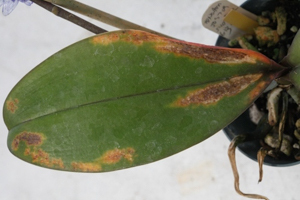 Symptoms: Bacterial brown spot is the most common and severe disease of phalaenopsis. The symptoms may appear anywhere on the leaf as a small, soft, water soaked blister. Initially dirty green in color, the infected spot enlarges, coalesces and eventually becomes brown or black, dried up and sunken. It oozes bacteria-laden liquid, particularly when the disease reaches the tip of the leaf. It is most prevalent during the warmer weather. - Phalaenopsis. The blister-like spots may be surrounded with a yellowish or pale green halo. Spots coalesce, and the infection spreads rapidly. If the diseased area invades the crown, the plant will die. - Cattleya. The infection enters through wounds on older plants and usually affects older leaves. It appears as sunken black spots that are clearly delimited. It advances slowly and is rarely fatal. Prevention: Pseudomonas cattleya is a water-borne pathogen that prefers warm, moist conditions. Reduce humidity and temperature (if possible), eliminate overhead watering and increase air circulation. Symptoms: The infections usually starts on the roots or basal portion of the pseudobulb, though all plant parts are susceptible. The disease spreads rapidly, particularly when the temperature and humidity are high. Pseudobulbs, roots or rhizomes show infections as purplish-black, often sharply delineated, discolored area in the center of the plant. 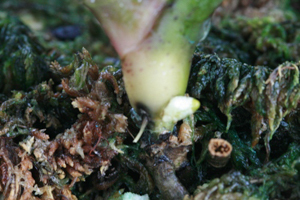 The infection often starts in the roots and may spread upward to the base of the pseudobulb or leaf, which can cause the leaf to fall from the plant with a slight jarring. In seedlings and community pots, small water soaked spots may start on the seedling, and plant after plant rots and dies. - Cattleya. May show a creamy yellow discoloration on one or both sides of the pseudobulbs. The discoloration eventually turns black or brown and softens, and the bulb rots. Treatment: Unless the plant is valuable, the best approach is to discard it, as the disease is highly contagious and will spread from plant to plant from splashing water. If the plant is valuable, isolate it from your other plants, remove infected tissue with a sterile tool, and drench with a suitable fungicide like Subdue or Banrot following label instructions. Prevention: Wetness and high humidity contribute to the spread of the disease. Consider using a suitable fungicide drench like Banrot, Subdue or Aliette particularly during very wet or humid periods, following label instructions. 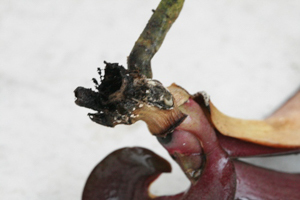 Read More: Black Rot (Robert Cating, University of Florida) Phytophthora Diseases of Orchids in Hawaii (J. Y. Uchida and M. Aragaki, University of Hawaii) and Black Rot (Susan Jones, American Orchid Society). Symptoms: Fusarium blocks the flow of moisture through the plant’s vascular system. - Cattleya Alliance. Fusarium can infect a plant through orchid roots or by invading the rhizome of recently divided plants. The pathogen is often spread through improper hygiene, generally as a result of using nonsterile cutting tools, which transfers the fungus from plant to plant. Infected leaves are yellow, thin, shriveled, wrinkled or wilted and eventually die. Severely infected plants may die in 3-9 weeks, while mildly infected plants gradually decline over a year or so. 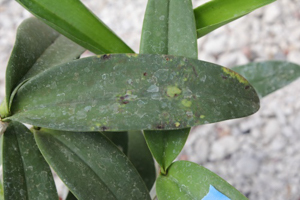 The diagnostic symptom in the cattleya plant is a circle or band of purple or pinkish-purple discoloration on the outer layers of the rhizome evident when the rhizome is cut. 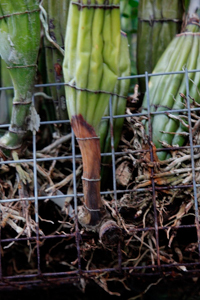 If the disease is extensive, the entire rhizome may turn purple, and the discoloration may extend to the pseudobulbs. - Phalaenopsis and Paphiopedilums. 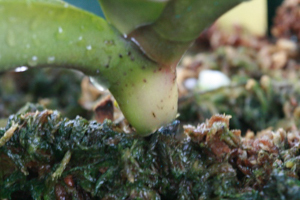 Per Hark Orchideen, infestation can be caused by too high a salt concentration, low substrate temperatures, and substrates that are too wet or contain too much peat. Roots begin to rot and the base of the plant develops a back dry rot. Sunken spots on the leaves enlarge and form yellow streaks, older leaves become leathery and younger leaves may become reddish. The flower stalk can develop sunken, rotten spots with premature bud drop. Treatment: In cattleyas, discard infected part of rhizome and pseudobulb if the purple band is evident. Repot only the part of plant showing no purple discoloration. Drench sanitized plants in a suitable fungicide like Cleary's 3336 or Medallion following label instructions. Be diligent in disinfecting growing area and cutting tools. Each time the cutting tool contacts infected tissue, it should be sterilized before making a second cut. 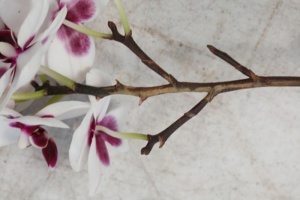 In phalaenopsis and paphiopedilums, discard severely infected plants, remove severely damaged tissue and all infected roots and treat with a suitable fungicide like Daconil, Heritage (drench) or Switch (spray) following all label instructions. Prevention: In cattleyas, prevention is generally a matter of following proper hygiene. Sterilize cutting tools after each use, preferably through flame sterilization. In phalaenopsis, proper temperature, substrate wetness and fertilization will help prevent occurrence. 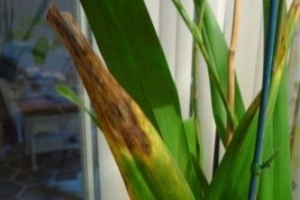 Symptoms: The main symptom of Southern blight or Collar Rot is a rapid collapse and rotting of the roots, pseudobulbs and lower parts of the leaves. 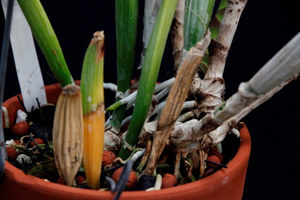 Roots, pseudobulbs, leaf bases and the lower part of stems turn creamy yellow. The affected tissue becomes brown (resulting from invasion by secondary pathogens), collapses and rots very rapidly. The disease eventually girdles and destroys the entire basal portion of the plant. Affected leaves yellow, wilt and die. Small yellow or tan sclerotia resembling mustard seeds form on the affected tissue. This is the resting form of the fungus. - Phalaenopsis. Base of stem turns light yellow, later dark brown, and infections spreads to roots and leaves. White fungal growth can sometimes be seen on stems with rapid collapse and rotting of roots, pseuodobulbs and leaves. This fungus thrives at high temperatures and humidity. Treatment: Remove infected part of roots and leaves using a sterile cutting tool, drench the remaining plant in a suitable fungicide like Medallion or Pageant following label instructions. Disinfect growing area with 10% bleach solution. Prevention: Normal sanitation, good air movement and lower temperatures (if possible) may help reduce the spread of this disease. The pathogen is most active in warm weather when humidity is high. Symptoms: Root rot occurs when the medium breaks down, drainage is poor and/or plants are overwatered. Rot sets in when roots are damaged by injury or salt buildup from hard water or over fertilizing and the levels of the Rhizoctonia solani fungus increase to dangerous levels. In cattleyas, Rhizoctonia moves slowly from the older to the younger pseudobulbs and moves up the pseudobulb, which turn brown and hard, ultimately becoming husky. The roots on the older, infected parts of the plant die. Rhizoctonia is primarily a root disease, but the symptoms can be noticed on aerial parts of the plant resembling the damage caused by Fusarium. Leaves become yellow, shriveled and finally drop and older pseudobulbs brown from the bottom up. Treatment: Remove infected part of the plant using a sterile cutting tool, drench the remaining plant in a suitable fungicide like Cleary's 3336, Medallion, Terrachlor or Pageant following label instructions. Disinfect growing area with 10% bleach solution. Prevention: Make sure your potting media is fresh and your plants are not overwatered. When disease is suspected in other plants or when repotting is overdue, unpot the plants, check their roots and repot as necessary. In hard-water areas, pots should be flushed at least monthly to prevent root damage by watering heavily to solubilize the salts and then watering heavily an hour later to flush the salts from the pot. 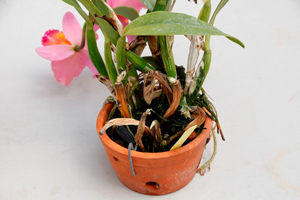 Read More: Root Rot from Rhizoctonia (Sue Bottom, St. Augustine Orchid Society). Symptoms: This fungal disease infects the aerial portion of the plant. The leaves are most often attacked. Leaf tips turn brown beginning at the apex and proceeding toward the base. Dark brown or light gray patches develop, sometimes as concentric rings or as numerous dark bands across the leaf. The affected area is usually sharply defined and somewhat sunken, while the remainder of the leaf appears normal. Sporing bodies develop in the infected area. Flowers develop watery, black or brown pustules which are usually raised and occur on the underside of older sepals and petals. The spots may merge and cover the entire flower. The pathogen usually associated with Anthracnose is Colletotrichum gloeosporioides (asexual stage, the sexual stage is known as Glomerella cingulata). Another pathogen is Colletotrichum theobromicola, not before reported as an orchid pathogen. 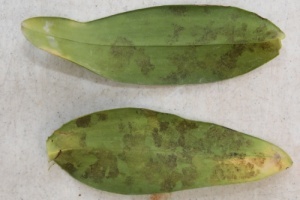 This pathogen causes a chlorotic mottling on the upper surface of the leaf, with corresponding patches of fine tiny spots occurring on the leaf underside. There is an occasional sunken or necrotic spot. Prevention: Normal sanitation, good air movement, lower temperatures (if possible) and increased light may help reduce the spread of this disease. The pathogen is most active in warm weather when light is low and moisture is high. Cercospora Symptoms: Infection shows first as a yellow spot on the underside of the leaf. 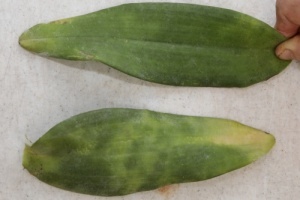 Soon after infection occurs, the yellow-green area may be noted on the top surface of the leaf. As the spots enlarge in irregular patterns, they become slightly sunken and necrotic and turn purplish brown to purplish black. The spots continue to enlarge in a circular or irregular pattern and may eventually cover the entire leaf. The advancing margin remains yellow. Heavily infected leaves usually fall from the plant prematurely, especially if the infection started near the base of the leaf. Pseudocercospora Symptoms: The Cercosporoid fungi primarily cause leaf spots and irregular blemishes. Depending on the Pseudocercospora species and orchid cultivar, leaf spots can be circular to nearly circular, reflecting the growth pattern of the fungal colony. Sometimes the circular blemishes are purple to black, with greater amounts of brown to black flecks forming as the spots enlarge. Other species of Pseudocercospora cause smaller, irregular blemishes generally in large numbers. A general mosaic pattern occurs on the upper leaf surface when large sections of the leaf are diseased. The leaf undersides can be covered with dots, the sporing bodies, that often match the patterns on the upper leaf surface. Guignardia Symptoms: The first signs of Guignardia infection are tiny, dark purple, elongated lesions on either leaf surface. These lesions run parallel to the veins and elongate into purple streaks or diamond-shaped areas. Spots often merge to form large irregular lesions that may affect a large part of the leaf. With age, the center of the lesion turns tan. Raised, black sporing bodies develop in the affected area feeling like sandpaper. Affects mostly ascocentrums and vandas and their hybrids. This blight is also known as Phyllosticta; the names apply to two different sexual stages of the same fungus. Phyllosticta Symptoms: Spotting from Phyllosticta may start anywhere on the leaf or pseudobulb. The lesions are tiny, yellow and slightly sunken. As they enlarge, they become round to oval and more sunken, especially if the infection is on the leaves. With age, they turn tan to dark brown and develop a slightly raised, red to purple-black margin. Eventually, tiny black, raised spore structures develop in the center of the spots. Individual spots are about ¼ in across. Severely infected leaves may drop prematurely. This blight is also known as Guignardia; the names apply to two different sexual stages of the same fungus. Septoria Symptoms: The tiny spots may start on either leaf surface as sunken, yellow lesions. They continue to enlarge, becoming dark brown to black, circular or irregular lesions. Spots may merge to form large, irregular patches on the leaf. Heavily infected leaves fall prematurely. Prevention: Good sanitation with good air movement. Reduce leaf wetness, water on the leaves may lead to infection. If the fungus is a continuing problem, monthly fungicide sprays may offer effective prevention. Symptoms: Very small, black or light brown, spots on the flowers. The spots may enlarge and cover the entire flower. If conditions are moist, a gray fungal growth may appear on severely infected or decaying flowers. Treatment: Remove infected flowers, then spray with a suitable fungicide like Daconil. Some report success with the home remedy of baking soda, 1/2 tsp dissolved in 1 quart of water sprayed on the flowers. Always follow label instructions. This fungus is common in the environment and cannot be eradicated. Prevention: Remove infected flowers since these are reservoirs of infection. Infection may be reduced through careful sanitation, increased air circulation, reduced humidity and warmer night temperatures (>68F). Read More: Botrytis Blight (Aaron Palmateer, Bayer), Botrytis (Susan Jones, American Orchid Society). Microfungus, Phalaenopsis Chlorotic Spot Virus or Tiny Mites? Microfungus or Virus or Mites? We've heard this malady described as all three. Symptoms: In the order of appearance, the leaves display yellow chlorotic spots, then more defined yellow spotting that can grow into elongated yellow streaking, then pitting, and finally large areas of grayish tissue collapse. 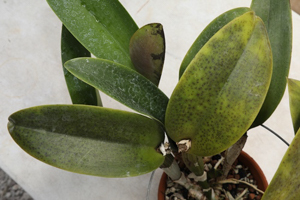 It can be confused with mesophyllic cell collapse caused by watering with cold water, although cold damage weathers to dark rather than light sunken spots in phals. Paph infections weather to darkish sunken spots. Cattleya may have small black spots on the leaves. From Bob Gordon Culture of the Phalaenopsis Orchid: "sometimes a condition prevails that is caused by a systemic infection of microfungi. As there are literally hundreds of these, the symptoms vary from plant to plant. Some of the more common are a spotty, ill-defined chlorosis; a streaky chlorosis beginning at the edge of the leaf where it looks as if the leaf edge had been burned with a match or candle; a red-brown coloration appearing at the apical third or half of the lower leaves followed by a dehydrated and senescent (old) appearance and also mesophyll tissue collapse where deep pitting becomes apparent on the surface of the leaves. This latter condition can also be caused by cold water and by virus infections. However, in the latter instance, the pitting is usually dark-brown to black in appearance rather than the white to light fawn caused by fungi." Treatment: If you believe it is broad mites, spray with a miticide (labeled for Tarsonemidae family mites) at the first sign of chlorotic spotting. If you believe it is a microfungus, follow the recommendations from Alan Koch of Gold Country Orchids: spray first with Banrot plus Aliette, then Cleary's plus Subdue, then Banrot plus Subdue. These sprays / drenches should be 7 days apart in summer and 10 to 14 days apart in winter, all at label strength. The combination of fungicides results in a synergistic effect. Follow all label instructions and wear protective equipment. The opinions and recommendations published herein are those of the authors. The St. Augustine Orchid Society disclaims responsibility for any losses or damages that may be attributed to the use or misuse of any material or any opinion published in these articles and on the website. This website and the photographs, articles and content are protected by copyright and no part of them may be reproduced or re-used without the permission of the author.